Vantage Search Auto Suggest is a plugin that enables a Google-like “Auto Suggest” feature right into your Vantage theme. Search is an important feature of Vantage theme and is evident by the sheer preference given to the search box in the design, however a lot of us have been spoiled by Google’s Auto Suggest feature. Many users expect now every search to function like that of Google’s. This plugin gives you a chance to give the same functionality to your users. Unfortunately, Vantage doesn’t have the Auto Suggest search feature. It was a requested feature in the forums too, so we decided to cook this plugin for you. Now, you can offer the “Auto Suggest” functionality to your visitors by enabling this plugin. As soon as, the users would start typing, the intelligent search engine would automatically suggest various posts or events making it easier for users to select. 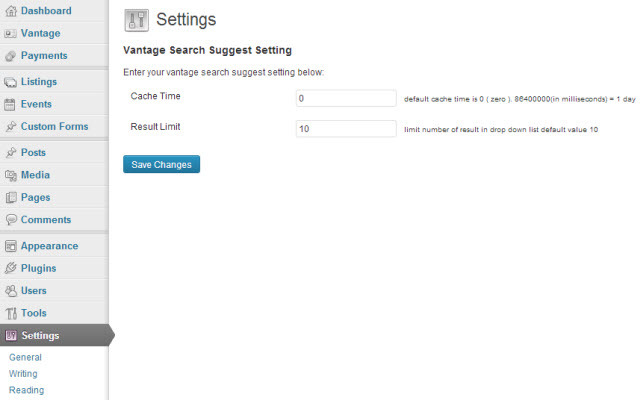 Note -> Read Before You Buy: The plugin has been made compatible to default Vantage theme’s search box. Its CSS is not guaranteed to work with any of Vantage’s Child themes. You’d have to contact me to get the CSS to be fixed. It would attract an additional charge of $30-50 depending on how much time it takes. My Answer To This Review (Click here to read review): In all honesty, I agree with Eric – The plugin will lose on speed because we have to make queries in the database rather than creating a JSON file for all the entries in your website. We had taken the JSON approach however had to switch to database because of the feedback from ITFind (1st site in Sites using The Plugin). JSON file becomes too heavy in size if the listings are more. In case of ITFind – the size of the JSON file became 2 Mb in size when it could only process 3,000 entries. Whereas they had over 150,000 listings. That JSON file gets downloaded whenever the page loads – i’m sure no webmaster would want a page that heavy! That’s my 2 cents in defense of this plugin and the hard work that we’ve put in it. The developer shouldn’t be blamed for poor web hosting. A good web hosting with good database server will certainly be able to deliver the results faster. ITFind.It: The site is running on a shared server and has got 150,000 listings! Punjabi Center: The site lists businesses focusing towards Punjabi community. Please see the changelog tab for the changes. 1. Revamped UI for plugin’s settings. 2. Optimization of speed of the results fetching. You can also set the number of search results you want to Auto suggest with in plugin settings too. Changed how suggestions are shown. It now features Address & the category in which the listing was added right in the suggestions. Click or Enter on the suggestions takes user directly to the listing – thus saving lots of clicks. Earlier JSON file was regenerated every time a listing was added or removed. Now, the changes are incremented (if new listing is added) or updated (if changes are done in the existing listings) with each change. This makes the plugin scalable. Changed the way plugin worked. While implementing it on ITFind.it website (had 150,000 listings at the time it was implemented) figured out that JSON file was huge in terms of size. with just 3,000 listings only – the size of JSON file was 900kb. Now, plugin queries directly in the database, so no JSON file is generated anymore. Since the search call is made to the server (remotely), it takes some time before the search results are returned – Added an animation that notifies user that we’re waiting for the search result. User can now choose to show the category or address in the settings. Add: CSS box in the settings that allows users to store the CSS settings specific to their site. Plugin works with Default theme – so buyer may have to edit the CSS specific to their theme/child theme. Fix: In Firefox, click on the search result wasn’t taking the user to the post. Fix: <Title> of the settings page. Added option to include categories & tags in search results. Optimized search to show search listings starting with the character that was entered in search result. Only Active listings would be shown. No expired listing will be shown. Cross browser compatible for click redirection. It wasn’t working with Firefox earlier. Made changes in the CSS to ensure more listings can be shown. Added: User now has the option to set custom headings for categories, tags & listings in the search result. Fixed: If category name is empty, the search coloum will span full width according to the search field’s width. Added: Feature listing now appear at top in search results. Fix: Auto suggest would work even if events are disabled in Vantage settings. Earlier both post types had to be enabled. The plugin does what is supposed to. I needed some support to start using it, because I had some issues related to CSS. The developer could improve it and add some extra feature like location auto-sugest using google maps api. Installed it , didn’t work … asked for help , no response … reinstaled everything ,nothing …. about support … not even one response to forum or pm … I know it’s only $ 29 .. can I at least get thanks from you .. This plugin allows you to search by category and city or keyword and city. Then you can further refine your results by distance. Mayank and his team continue to develop the plugin and enrich it with more features and functionality that really enables the site operator to offer a directory service that is truly local. I am really disappointed… based on the review, that feature seems to be great but apparently, they were force to do some changes to modify the way the search is done and now that the search is done directly in the database rather than a JSON file, the search speed is really slow… well… maybe not if you have really good hosting server. I do not have a suggestion for them but they definitely need to speed that up. I will not ask for a refund… simply because I believe that there is something that can be done and I hope they will act on it. I think it is a must plug-in bought it recently and very pleased with it. Should it not be the standard function in Vantage. Let me say this plugin is fantastic! It does exactly what I needed. I had a problem with the plugin and the developer worked on it right away and fixed it, so great support too. As I can see he’s also working on creating location auto-suggest which would make the plugin even more useful. Hey guys – just installed plugin for my page and must say – it’s great – and it will be even better in future because author adds additional features. When reading comments like “will wait for future releases as.” than I could shake my head – $19 is it worth to support each plugin to forced and commit the development of an plugin – waiting for a chicken bringing golden eggs is wrong way! Myself supporting each plugin which I think it is worth to go for – from the beginning – and appthemes and their developemnt partners doing great job for really fair price. So I could recommend this plugin without doubt – great job mayank. you wrote the above 9 months ago..”very soon” ? means weeks maybe 2 months.. but 9 months and still no auto-suggest for clasipress?? are you really making it? or not? The plugin has been build. We’re working on its documentation and getting it approved by the AppThemes’ team. 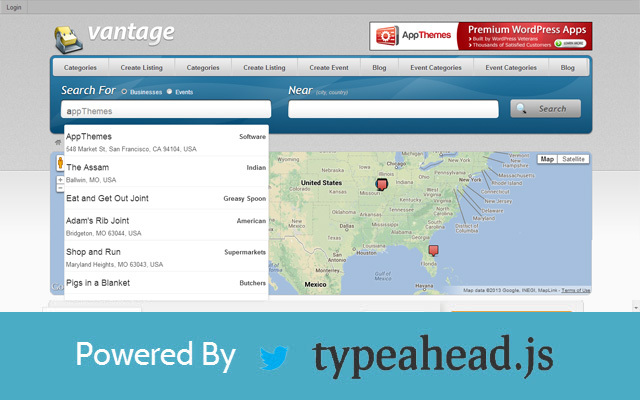 I’m using Successweb as a child theme for Vantage. Will customizing the CSS to make this plug-in work be a huge chore? Can you please share the link of the website in the support forum. im trying to set up the auto suggest to only show categories & so that when i click the link to the category it will go the search page rather than going direct to the category page. if you type “tummy” you will see “Abdominoplasty- Tummy Tuck” being suggested however when you click it it goes to http://www.pricemyop.co.uk/listings/…ry/tummy-tuck/ i need it to go to http://www.pricemyop.co.uk/?ls=Abdom…Tuck&location= so i can get the sort by to so as this is working of refine by. If someone can help then that would be great. Hey @Jigsawmark : I hope you’ve received the updated plugin and are able to use the new feature without any issues. I purchased this plug in, and did not release it would not work as I do have child theme install, which means the plug in does not work as the “install” instructions suggested. I would recommend putting a notice there that his plug does not work with child theme. I’ve already written in the description of the plugin that the plugin is compatible only with the vantage default theme and no child theme. Until specific changes aren’t made to the child theme – the plugin will not work. The refund in this case can only be done by the AppThemes staff as I don’t think that you read the description before buying it. Do you have an update to my compatibility issue with the Directory theme? I would suggest this would work for popular child themes such as the business directory provided by vantage. I will need to rate low star if plug in does not work as this actually cost more than $29USD. Not impressed. I am gonna buy the plugin but I need some answers before . First in requirements says advanced search what you mean by that ? Second I want user to search by “what” for example category and then where near with auto suggest . For example search tyres auto suggest and clicking in the results place and search with auto correct in the near section again with auto suggest for regions from Google map. I found the locator plugin that makes the half job but I do not know if works with your plugin 100%. Is this plugin working with directory child theme? This thing looks nice! Why not making it work with directory chikld theme? I think its the most used one. Ive bought one autosuggest but this one is what I need. Would you consider helping me to get it to work with directory child theme if I buy this plugin? Does this work with bfinder…? Do you plan to make this plugin available for classipress? Hi, does this plugin work with the Flatpage (Vantage) child theme? it will work with Bfinder? have you sell this item to any Bfinder child theme user? – If you enter “city, country” the search doesn’t find anything. If you enter just the city, or city and state, or just state, the search finds nothing. We would be better off if NEAR wasn’t even used in the search. Can it be eliminated/removed? – Refine Search and changing the radius doesn’t seem to do anything anymore. Your demo site is no longer working is this plug in still being updated and supported? Is this plugin works with Vantage 4X? Perhaps appthemes can respond if the plugin author is no longer supporting it.